This is a complex configuration which combines the aspects of replicating a shared storage environment to multiple shared targets. Note that the number of systems in the Primary Site does not have to equal the number of systems in the Remote Site. Also note that only the Source Server has access to the Source Volume. Shared Source systems and all systems on the target side cannot access the volume and are locked from the file system’s perspective. Users who wish to provide the same level of availability in their DR site will deploy this configuration to ensure that regardless of what site is in service, the availability level stays the same. 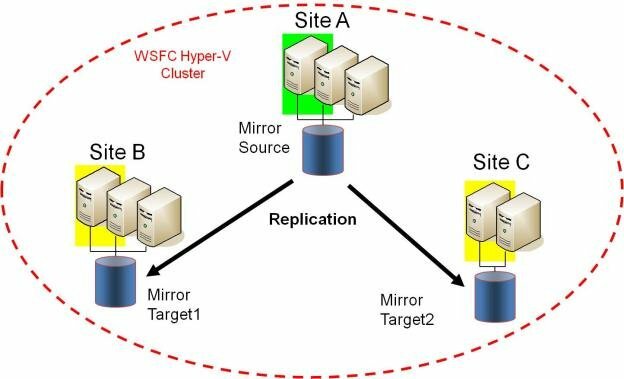 Where Hyper-V clusters are configured with virtual machines distributed across many cluster nodes, it is important to have a similar number of cluster nodes available in the disaster recovery sight to ensure that the resources are available to run all of the virtual machines in the event of a disaster.